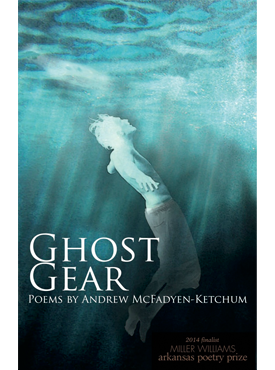 Ghost Gear chronicles the poet’s coming of age in a working-class neighborhood in Nashville, a fractured place where fathers worked overtime at the nearby Ford Glass plant and kids roamed the streets. These poems of an urban life are joined by verses inspired by tales told by McFadyen-Ketchum’s father, who took his children to explore the natural world surrounding the city and regaled them with stories of his own childhood: a near drowning by tidal wave on the Aleutian Chain, a near copperhead strike in the black willow swamps of Shreveport, sleeplessness after a science fiction radio story. In Ghost Gear, the “citied south” joins tales of the father, a longer ago childhood bleeding into a more current one to create a mythology all its own. Andrew McFadyen-Ketchum is an adjunct professor and freelance editor in Denver, Colorado. He is founder and managing editor of PoemoftheWeek.org and editor of Apocalypse Now: Poems and Prose from the End of Days. Read his work at AndrewMK.com.